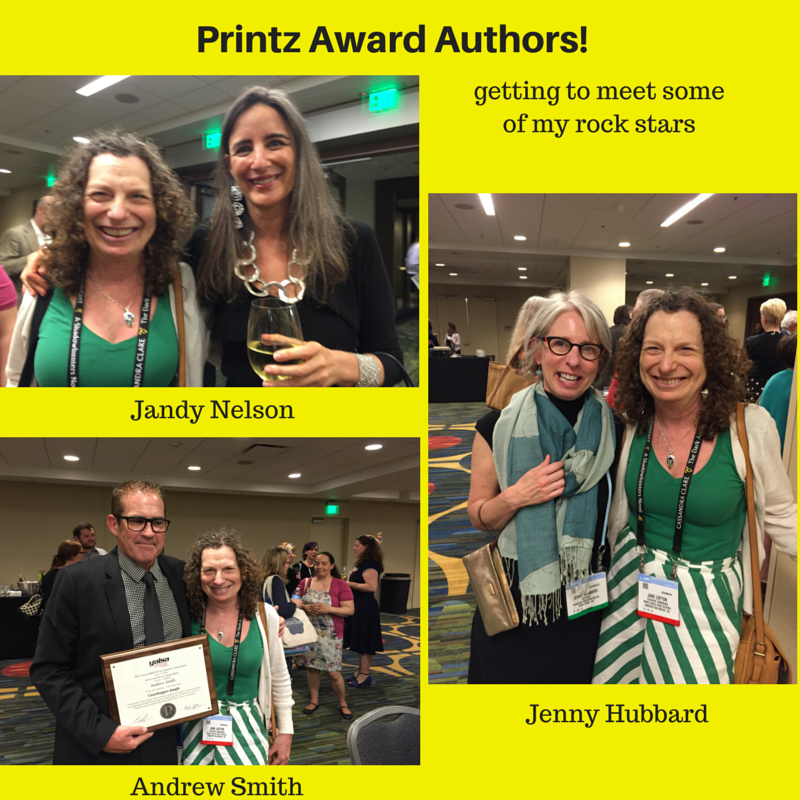 The Printz Awards Ceremony and Reception took place on Friday night, the first evening of the conference. This is the second year that program included a panel discussion with the winner and the three honor book winners: Jandy Nelson, winner for I'll Give You the Sun, and honor book authors Jenny Hubbard, Andrew Smith, and the Mariko Tamaki/Jillian Tamaki author/illustrator team. I love that format, since we got to hear from all the authors. I had read all the books, so was excited to hear all of them. One of the interesting topics was how they work and revise. Jandy Nelson shared that it took her two and a half years to write her book, and tons of revisions. She also mentioned that she kept the documents with the two different character's story lines completely separate while she was writing and only merged them at the end. Most of the other authors also talked about a long revision and rewriting process. In contract, Andrew Smith says he writes only one draft! I'm always fascinated to hear about such different techniques. After the formal part of the session, we got to mingle at a reception for the authors. I was lucky to get to meet three of them. I am always amazed how friendly and open these rock stars are! Five of the authors - Anthony Doerr, Kate Racculia, John Scalzi, Zak Ebrahim, and Michael Kortya - were able to attend and speak at the event. I have been working my way through reading these books and was very excited that Doerr, Racculia, and Ebrahim, whose books I loved, were speaking. And, after hearing Scalzi and Kortya, I couldn't wait to read their books also, and made them my first reads after the conference. Each of the books is incredibly different, from Doerr's moving historical fiction based during World War II, Racculia's mystery / ghost story, Scalzi's futuristic science fiction murder mystery, Ebrahim's memoir of living with a terrorist father, to Koryta's contemporary murder mystery set in the Montana mountains. Several of the speeches moved both the authors and their audience to tears, as do the authors' books. These are all also not-to-be missed titles! The last three of the ten are on my "next reads" list. 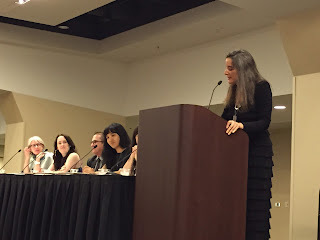 My third awards event was the Odyssey Awards for the best audiobooks of the year. At this session, the narrators of the winning audiobook and the honor audiobooks speak and read a passage from their books. I had only read one of them, The Scandalous Sisterhood of Prickwillow Place by Julie Berry, narrated by Jayne Entwistle. It is such an amazing experience seeing and hearing someone in person who I had previously known only as a narrator on a recording. Entwistle was captivating both in her recording and in person, and she warmed us all sharing her personal love of books. Cassandra Morris, narrator of A Snicker of Magic couldn't be there, but we were treated to both the authors and narrator for Five, Six, Seven, Nate!, since Tim Federle served as narrator for his own book. I loved hearing him share how he learned to turn weaknesses, into a strength, even narrating his book despite growing up with a lisp. 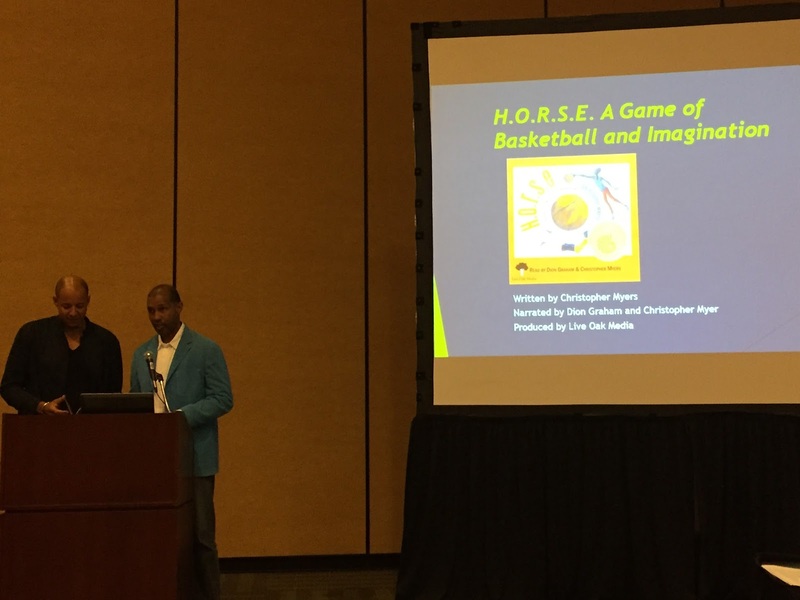 Last, we heard from the author of the winning book, H.O.R.S.E. 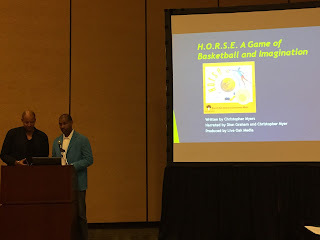 A Game of Basketball and Imagination, Christopher Myers, who also narrated along with Dion Graham. They brought the event to a wonderful conclusion, sharing their belief in the important skill of listening, and that bringing the narrators to a live event also enriches the experience with conversation. Ginny Rorby, author of Hurt Go Happy & forthcoming How to Speak Dolphin, both exploring issues of teens with disabilities. 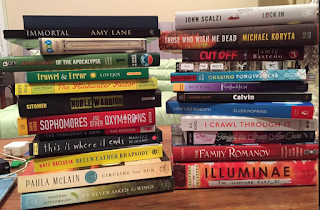 Many thanks to YALSA and all the wonderful authors and publishers for these great opportunities to learn more about books and authors that will enrich my library and reach my students. 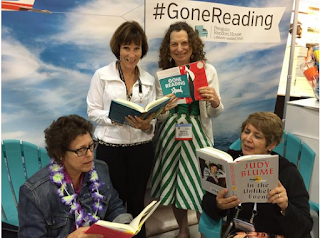 For more about my ALA Conference experience, see my last posting, "The ALA Conference: A Perfect Time and Location." I'll also be writing one more posting focusing on the AASL events I attended. The reason I liked NY venues is that this place so intimate and personable and while having astounding atmosphere! Really more suited and perfect for experiencing great food and having a good time.